"The palmar grasp is elicited by stroking the radial side of the infant's palm with one's finger; a rapid grasping of the finger follows." The article mentioned in my last post discusses how our brains develop a memory of how much force is needed to maintain and support a grip on an object. Such as in feeding oneself with a fork. Clumsiness can be a result of the brain not able to retain the proper memory of how much or little grip force is needed to get the fork from plate to mouth without making a mess. (Down's Syndrome and Cerebral Palsy were examples). I would 'speculate' that the growing, developing hand very early develops hand features reflecting the strength, dexterity and coordination needed for that child to accomplish goals such as climbing out of the crib. "The arrangement of the 27 hand bones provides a structural base for great functional adaptability. The configuration of these bones, together with the supportive ligaments, tendons, and muscles, enables stability and mobility for all hand joints during various actions. The child's developing hand changes proportionally as well in size, requiring constant adaptation throughout childhood. Significant correlations have been found between changes in hand-size, digit lengths, and strength in children from 6 to 11 years." To bring all this into context. 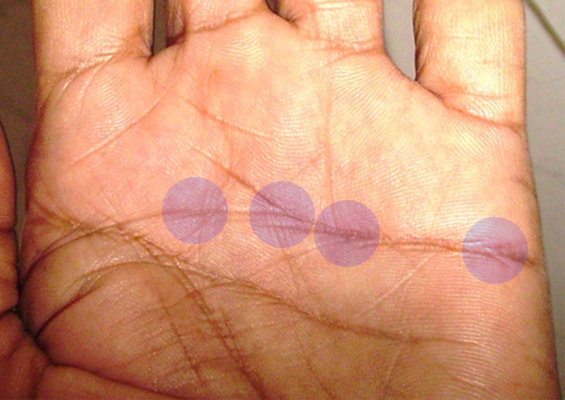 "Union of major palm creases is likely to be caused by powerful hand grip because of the following results. Closed, simian, Sydney and Suwon creases, in which major creases were united, were frequent in males and the right palm, both of those are know to have powerful hand grip, and these results are consistent with other studies." 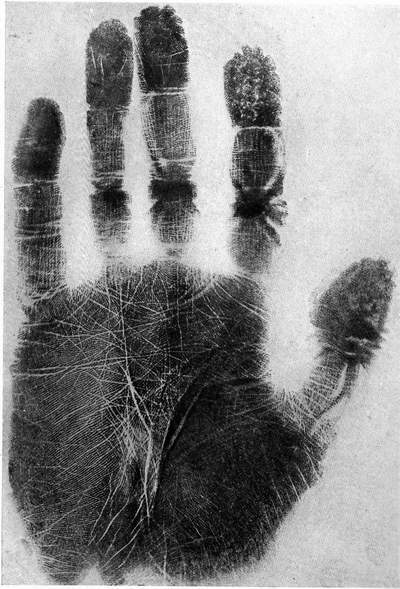 All of this implies that in some hands, the union of the major palm creases develop after birth and in very early development of the growing hand. Thinking about the relative connection to finding a passion crease involved in the 'strong grip' of the Suwon creased hands, I noticed in looking at primate hand and foot examples there is a deep angled groove between the pads in the same location. You can see these illustrated in Cummins & Midlo's "Finger Prints Palms and Soles" page 156 and 157. Also, if you have their "Dermatoglyphics in Primates" page 17 there is a photo of an Aotus Zonalis (some kind of primate) with a very noticible angled crease that goes all the way to the radial edge of the palm. I'll scan it if you don't have it. I think it may help validate the passion line being present in the development of strong hand grip in some human hands. Thanks for sharing your considerations regarding 'hand grip', but I think we should not associate that aspect of the article with Suwon crease... especially since the Suwon crease has been observed more frequently in the LEFT hand. Actually, I think that aspect of the researcher's comment was induced by only a very general (arbitrary) pattern in their sample's results ... but earlier studies have shown opposite results regarding male vs. female differences, and left- vs. right hand differences. PS. 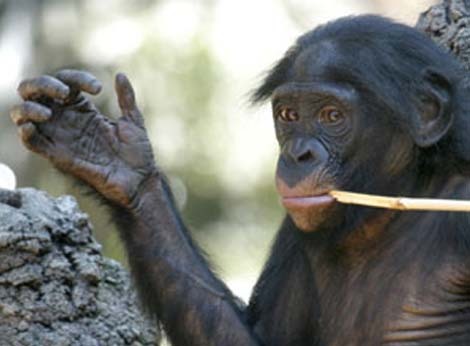 Regarding the hands of primates, since we know that these are often featured with multiple transversing crease... I think it can be more rewarding to look for patterns which directly reminds us to the Suwon crease. I would love your comment on the line in this photo of one of our members who asked for a request. The heart line crosses the head line to enter the Mount of Mars- so does this relate to the Suwon crease? I am querying as it seems to be independent of the head line, rather than the head line having a branch join it. Normally it can indicate issues with tension. My thoughts on it being more frequent in the non-dominant hand, typcially the left hand, was because it naturally has less strength than the dominant hand. The researchers imply that "strong hand grip" is a cause for the closed, simian, sydney and suwon creases. I'm suggesting that the closing caused by the Suwon crease may have formed after birth rather than before and could be from developing strength in the non-dominant hand. Bringing in the primates as examples isn't any more a problem for me than it was for Cummins and Midlo. The primates needed very strong hand grip to hang and swing from trees - which likely explains the evolution of their transverse creases. No problem Martijn if you disagree with my contributions. I'm accustomed to it! Earlier in this discussion Patti already introduced that hand for consideration (page 5), and on page 9 I have described - featured with the ZOOMED photo below - why I think that this hands can simply be described as: a 'splitting heart line' - with one splitting reaching out to the side of the hand (which creates a 'complete transversal heart line'). Patti, I am glad to hear that you can deal with this situation... sorry, I really can't help it that in this discussion I had to disagree on quite a lot of points. would my hand crease be classified as a suwon crease ? Nope, definitely not a 'Suwon crease'. Because: 1) your hand doesn't show an 'extra' major crease; 2) nor a 'transversing' constellation (your hand only displays a 'bridge' which connects your heart line and the life line/head line). I hope this makes sense now!? 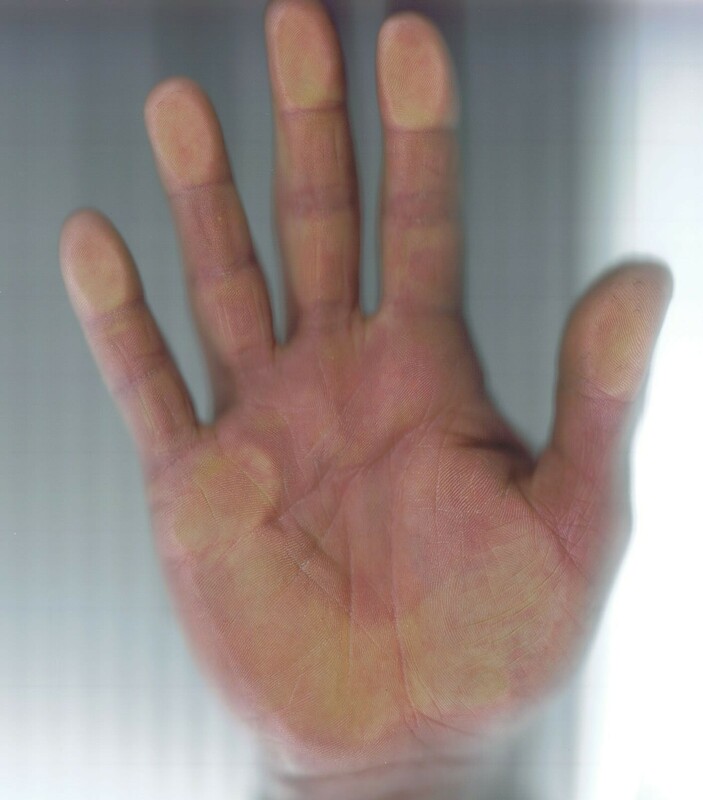 Hello All, Just had a gentleman with what appears to be a Suwon Crease on both hands, it was very well defined on the left hand but was less well defined on the right hand, unfortunately the standard of the scan is poor but he was on his way to another destination so didn't want to delay him too long. I received a scan of a right hand (see below)... but this is definitely not a Suwon crease: the heart line appears to be connected with the head line - an example of an incomplete simian line! I too struggle with the pure naming and classification of the lines and in particular the Suwon line, now lauded as possibly indicating high intelligence when the sample group was University students rather than the general population. And in that case the occurrence was small. It's disassociation with the person is not the same as an extended understanding and discourse as with readers and sitters which often gives a better insight as to the relevance of the line and the interconnections. It also would be hard to establish whether the line had appeared later due to something affecting their life or whether it was there at birth as is the observations of babies with the hockey stick line, fragile X etc. For me this especially relates to the hand I showed you where you said it was an incomplete Simian line. The sitter had a normal heart line and head line but with the strong line- as established by width, radiating up from the head line to the heart line. This is a problem for me, and I know the academic school has established variants of lines such as described, the Simean line comes with the passive zone- the quadrangle, largely not present but either the heart or head line displaced from it's position to become one. This, as I have found invariably reduces the capacity of the person to mull over events before reacting. As often demonstrated in people with Down's syndrome, a lot of whom I have worked with and love, but who when their routine is disrupted become very upset. The long head line is nearly always associated with someone with a very dogmatic approach, but who will take things on if they are convinced it is correct. The aberrant headline, particularly with the simian has a high association with someone, who has developed a drug habit to cope with this vulnerability to emotions being expressed or felt with no buffer zone. So I hope the academic study does look at the line holistically and refer to books which have recorded its appearance and associated characteristics, even though they may be outdated. Regarding the 'Suwon crease': the early results came from a study including MULTIPLE populations... including a control group of 200 males representing the general popoluation (but again, I have not yet studied the related female populations... I expect to be able to present more results in the beginning of 2011). Sorry, I don't understand your last comment: which 'line' do you have in mind??? (Because both the 'Suwon crease' and the 'Hockey-stick crease' have never been discribed in the palmistry literature). The Suwon is often referred to a 'letter of affection' in old literature and is used to indicate a strong emotional attachment has overridden the normal thinking process.... this is when a line- extra head line if you wish travels up strongly and connects with the heart line. In the case I presented with the photo, at 14 he had met his future wife, which essentially changed his whole perspective, the parents sent her overseas for a couple of years to get her away from him, but on returning they remained steadfast in their affections and are still married today. The aberrant head line was connected with use of hashish, though he could not remember whether he had had it as a child. He has been loyal to the point of supplication to his wife in 30 years of marriage, sacrificing his love of country living. His wife has an extremely strong first finger top phalange- which in my Kabbalistic understanding is Aries and also Chochma. This is an interesting point you're making. It would seem that the suwon crease would involve two distinct radial beginnings to the head line. One that meets/merges with the heart line. Yet, earlier somewhere in this discussion, Lynn uploaded a person's left and right hands with the Suwon crease. One of the hands did not have a radial beginning for two head lines as I recall (could be mistaken). The lower head line appeared to start out in the palm with another branch taking it farther. If that counted - so should your sample. Your sample does not fit any of the descriptions for a Suwon especially as there is only one head line at the radial side of the hand. In the image you've uploaded, it shows the head line breaking and branching upward to the heart line in the same location a 'mystic cross' is often found. I've been working on some thoughts about the psychological aspects of a person with a Suwon crease. I do believe it has been refered to in several palmistry books. Not in the same technical way as this scientific report that gives narrow and strict definition, but in the way as to how you are looking at it. How it plays out in someone's life. In that case we're looking at the territories it crosses and to paraphrase one author, if the crease is outside it's territory, it's not (or the person is not) equipped with the tools for it to operate. It's out of it's element, so to speak. Felicity Martin wrote: The Suwon is often referred to a 'letter of affection' in old literature and is used to indicate a strong emotional attachment has overridden the normal thinking process.... this is when a line- extra head line if you wish travels up strongly and connects with the heart line. For example, can you specify where you found these comments about '... a letter of affection'? A quote (+ source) would be very welcome... because maybe it can help us move further in this so far rather technical discussion. hi Felicity, I can't view your image. the link is taking me to photobucket homepage (?). Isn't it the image in Martijn's post? I have come across the concept of "a strong emotional attachment has overridden the normal thinking process" often in studying various interpretations of long and downward bending heart lines. Actually, before I give the author's description, I'll put the hand image up for discussion. In my view it's a Suwon. Patti wrote: Actually, before I give the author's description, I'll put the hand image up for discussion. Sorry, I think this example can simply be described as a classic example of a simian line variant. But obviously, it is not a 'complete' simian line because the head line can be described as perfectly normal. A FEW MORE DETAILS: The heart line follows a straight path and merges with the beginning of the combination: head + life line. The other lines positioned above the heart line could be described as 'minor lines' (because these are all smaller than 2 ridge lines... except some parts of the venus girdle). Because this is a classic simian line variant, it can not be described as a Suwon crease. PS. I think your 'opinion' displays confusion: because the logicial consequence of your opinion is that any 'complete transversing heart line' could be described as a 'Suwon crease'... but that does not correlate with what the Korean researchers described about the Suwon crease. And for sure, if they had counted very 'complete transvering heart line' as a 'Suwon crease' then they for sure would have arrived at much higher statistics - for both the men and the women! From my point of view, the presence of the 'distinct markings' (your words)... are actually a necessary requirement for recognizing a 'Suwon crease'! (edit: on top of the accesory II - which is described by the researchers at the other essential element of the 'Suwon crease'). We have those things here. Which I pointed out. In my searching through heart line samples and various books regarding heart lines. There is a distinct difference in a long transversing heart line and this particular crease with the Accessory crease or second lower head line. Same distinction when you're looking at a Sydney and knowing it's not just a really long head line and there's something odd about the placement of the actual heart line. Because of the nature of the II + III you are already dealing with the concept of a simian crease. From quotes posted earlier from Plato's book there is no such thing as the long transversing crease being just a single crease, as in just a long heart line or a long head line transversing from side to side. The simian is both lines joining. II + III. The extra crease Accessory II or Accessory III give the transversing head line heart line (simian) the more distinct classifications of Suwon or Sydney. Just as a Sydney Line isn't just a long head line, the Suwon is not just a long heart line. Therefore yes, I see the simian aspect, I also see the Accessory II crease giving it some sort of Suwon classification. In my opinion, from the Korean report, I got the impression they were using strict guidelines as to definition of the creases. More so than we as palm "readers" would. They strictly defined what constituted a minor crease and what was a major crease. They told us that sometimes minor creases can fill in for a lack of major creases in areas of the palms. I think in their strictness to eliminate any question of the long heart line being formed by minor creases, their results were narrowed down to the males. I also think that once this report is expanded, whether it's your report you expect to get out next year, or more information released by the Korean scientists, there will be, just like with the simian and the Sydney, variants and subtypes. It would be even more the unlikely case that there wouldn't be variants. Patti wrote: You are misquoting me! Of course... that is what the researchers describe!! Now, after this correction... where exactly did I 'mis-quote' you? Please specify! Well that's not fair! I go and respond to your post and find you've in the meantime edit your post!